Since 2008, the Steyr SSG 08 has been considered one of the best sniper rifles available at any price and one of the most accurate factory rifles ever made. For users who didn’t need the gun’s superb aluminum folding stock, Steyr Mannlicher designed the SSG 04, which offered the same barreled action on an adjustable fiber-reinforced stock. The gun lost some of its ergonomics and glamor, but its legendary accuracy was unscathed. Steyr then recognized some aficionados and small law enforcement agencies needed an accurate SSG-type rifle at an even more affordable price. So the company introduced the Pro THB (Tactical Heavy Barrel). This fantastic rifle is priced competitively with other varmint and tactical rifles from American manufacturers but adds many of the advanced SSG 08 features in a lighter, simpler design. Now Steyr is offering a new Pro THB in 6.5 Creedmoor with either a short 20-MOA Picatinny rail over the action or with a longer rail. I got my hands on the latter for testing, and it’s a killer package for long-range hunters, Precision Rifle Series (PRS) shooters and many tactical units. Like the famous SSG 08 and SSG 04, the Steyr Pro THB is based on the Safe Bolt System (SBS) action, which is one of the safest rifle operating systems ever designed. If the gun fires an over-pressured cartridge, or there’s an obstruction in the barrel, the shooter will remain protected while the rifle contains the detonation by its safety bushing. In my opinion, this is part of what makes the SBS the most advanced bolt system on the market. The safety bushing fully encases the four bolt lugs and the extractor, essentially protecting the shooter from escaping gases and preventing the receiver from rupturing. The four front locking lugs are massive. They’re directly behind the cartridge case inside the receiver. The bolt body has grooves that will collect dirt and debris to guarantee reliability during the most extreme conditions. After reviewing these features, reminding folks that all Steyr rifles have a protruding cocking indicator in the bolt or that the bolt lever retracts and locks into the receiver seems unimportant. You can choose between a thin bolt handle or the more common round knob, and I received the latter for testing. You’d need a pen and paper to list all of the features that set the SBS action apart from Remington clones. Normally, rifles have two-position safeties, but not this Austrian tack-driver. The new “2+1” safety, operated by a wheel on the tang, lets you select various modes of safety and operation. In the “safe” position, the weapon can be loaded and unloaded, and the trigger is locked, which prevents accidental discharges. When you’re ready to engage the target, just roll the safety wheel noiselessly forward to the “fire” position, and the rifle will be ready to shoot. If you decide not to engage, you can rotate the wheel to the “lock” position, in which a button on the safety wheel prevents it from rolling into any other position. The trigger and bolt are locked. The SBS has one more hidden trick in this locked position: You can depress the bolt lever into a position closer to the stock so it protrudes less. This also locks the firing pin and sets the action apart from the competition when it comes to stalking prey. There’s no protruding bolt lever to get tangled, yet you can noiselessly disengage the safety and shoot when needed. I use this feature on my SSG 08 all the time, and it’s very convenient. Steyr has done its best to bring its unique cold-hammer-forged barrels to this price range, as the Pro THB shares the famous barrel used in the SSG 08, with the same distinctive spiral forging marks on the exterior. These barrels are known for being accurate and reliable while lasting for a very long time. The .308 Winchester Pro THB is available with a 16-, 20- or 26-inch barrel, but my 6.5 Creedmoor test rifle came with a 26-inch barrel sporting a 1-in-8-inch twist rate, which is good for long-range shooting. The muzzle has right-hand, 5/8×24-tpi threading to accept most American-made brakes and suppressors. In my opinion, the most efficient barrels for 6.5 Creedmoor rifles are between 24 and 26 inches long, so the chosen barrel length was perfect for me. The 1-in-8-inch twist rate fits my bullet selections fine and suits heavy 140- to 143-grain bullets, but it will also let me shoot 120-grain Nosler AccuBonds if I need to. Also, I believe in over-stabilizing projectiles for long-range shooting, so this faster twist rate is consistent with my experience for long-range success. One note about the barrel profile: Years ago Steyr engineers used the SSG 08 profile to demonstrate that they could get heavy-barrel performance with medium-heavy barrels like this one, which has a muzzle diameter of 0.8 inches. I thought it was “skinny” at first glance but was wrong. Although most shooters might think they don’t need it, I recommend getting the long rail for the Steyr Pro THB, even though the standard 20-MOA short rail is capable. I say this because you can easily convert the Pro THB to a heavy scout configuration with a forward-mounted Aimpoint Micro H-2 sight. This Picatinny rail is a piece of art far above its price range. It’s CNC-machined from aircraft-grade 6061-T6 aluminum, which is light and much sturdier than any composite unit. Attention to detail is Steyr’s trademark, and all THB scope rails—short and long—are installed with six 6-48 screws, ensure top-notch rigidity. The shorter side rails up front are minimalistic and detachable. The side rails on Steyr’s modern tactical rifles are machined to fit into a recessed channel so the load is on the edge of the rail, not on the screws. This feature will be welcomed by many snipers and hunters who tend to place heavy accessories like laser designators on their side rails. You won’t see the screws shear here, as you might with other rifle designs. The stock is a fine polymer model with a straight comb. It has an aluminum bedding block to improve the action’s stability and support while preventing the action screws from flexing. The length of pull is 13.75 inches, but it can easily be adjusted with spacers. The cheek is not adjustable. The stock feels nice, with a flat front that will help in shooting over various supports, but it comes with two quick-detach (QD) sling attachment points that I would have replaced with push-button sockets. That might be a matter of preference, but for me, it meant changing the sling ends. The synthetic magazine holds four rounds, and you can use rounds with overall lengths up to 3.148 inches. Most reloaders who want to use the latest 6.5 Creedmoor bullets will appreciate this extra space. There is also an extension kit so 10-round magazines can be used. Another unique feature on the Steyr Pro THB and SSG sniper rifles is the two-stage magazine-latch mechanism, with a first stage that locks the magazine in but allows you to load rounds or operate the bolt without feeding from the magazine. With one more little push on the bottom of the magazine, it will seat it in the second stage, which is ready for autoloading. The triggerguard is part of the stock, and it’s big enough for gloved use. The trigger has a nice, crisp, 2.8-pound pull and looks to be adjustable, even though it comes with white locking compound to preclude user adjustments. Finally, as with most Steyrs, the rifle has a durable, rust-proof Mannox finish that I really like. At the range, it became clear that the Steyr Pro THB is superbly accurate for any standard. I shot about 160 rounds with three different loads: Nosler’s 140-grain Ballistic Tips as well as Hornady’s 140-grain Match ELDs and 143-grain ELD-Xs. After eye bore-sighting the gun the old-fashioned way—part of my standard zeroing procedure—I shot one round, which impacted up 1.25 MOA and 1 MOA to the right. After 10 clicks down and eight clicks left on the 7-40x56mm Leupold VX-6 scope I used, I was dead-center on the target. That made me smile, as I knew the rifle would be a shooter. And I wasn’t wrong, as the three commercial loads mostly created sub-MOA groups, with many tighter than 0.5 MOA. This is very impressive for a new rifle. Although this rifle shoots impressively well, another unexpected finding shocked me. The Hornady loads had basically the same trajectory at most medium hunting distances, and the Nosler load was just there, too. Adding to that interesting result, the three loads printed inside a 1-MOA circle with the same 100-meter scope zero. I’m starting to fall in love with the 6.5 Creedmoor and how well it shoots in this Steyr, and I hope to make it my primary hunting rifle for hunting small animals that don’t require a lot of energy on impact. No wonder the 6.5 Creedmoor has taken the PRS and varmint market by storm. It makes the shooter’s life easy—very easy. The Steyr Pro THB rifle is full of features—so much that I’m sure you will have to reread the article to really grasp all of them. It shares many of the SSG 08’s features, including its second-to-none accuracy. It’s also light enough for hunting and heavy enough for tactical use, and the only compromise has been the cheek height with the long rail. That’s a small price to pay to get this level of accuracy and features at this price range. This particular rifle will soon become my primary hunting 6.5 Creedmoor. That’s how much I like it. For more information, visit steyr-arms.com. 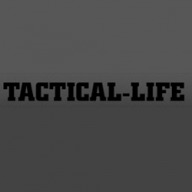 This article ran in the August-September issue of Tactical-Life magazine. Grab your copy at OutdoorGroupStore.com. The post GUN TEST: The Deadly Accurate Steyr Pro THB in 6.5 Creedmoor appeared first on Tactical Life Gun Magazine: Gun News and Gun Reviews.